Even as a kid, I've already heard so much about Bacolod. Its name is synonymous to sugar haciendas as far as the eye can see. The name rings opulence, extravagance, abundance and a free-wheeling lifestyle. Not without its social baggage, a powerful movie in the 80s, Sakada, depicted the abject conditions of the industry's sugar workers. I hear that has dramatically changed since. 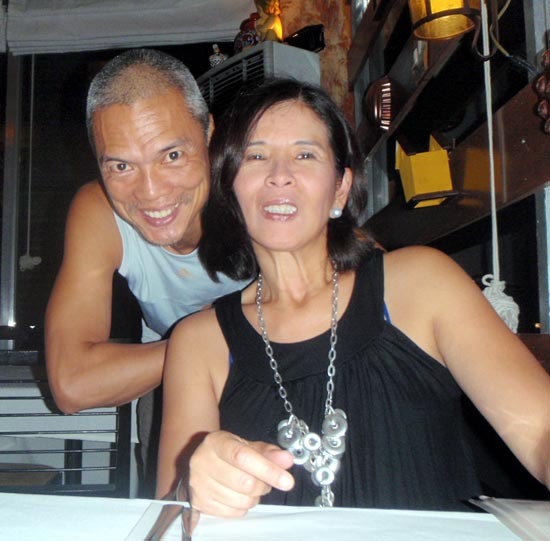 These are perhaps 2 ends of a broad spectrum that define Bacolod's cultural landscape. 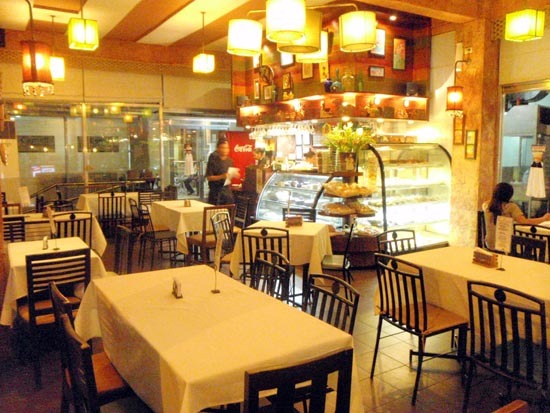 Present-day friends talk about gastronomic delights of Bacolod. It's the place to indulge. As a food enthusiast with epicurian and pedestrian taste, I was already salivating before I even stepped foot in the sugar city. After climbing Mt. Kanlaon, we defaulted to Bacolod City. Now I get a glimpse of this city that has long intrigued me. Armed with a spoon and fork, I went about exploring the city with my 4 remaining climbing buddies - Ian, Reggie, Aarone and Xtine. First stop was Manukan Country. While chicken inasal, the city's signature style of grilling chicken, abounds on nearly every street corner, Manukan Country is a section near the town plaza considered as the hub of chicken inasal. You find rows upon rows of chicken restos competing with each other to get customers inside their eating places. The ambiance is unpretentious, spartan and busy. Crowd turnover is fast (at least where we ate). And the chicken? It's as good as it can be. But don't stop there. Try their oysters. At P35/bowl, it's a great appetizer to chicken inasal. I'm a nut for batchoy. Often imitated outside Iloilo but never quite the same, Negros gets a knack for dialing it in. The batchoy I've had here can compete with the best of La Paz, Iloilo. For high-end batchoy (fine dining style) without the high-end price, I tried batchoy at 21 Restaurant - Lacson St at 21st St. Antoni, who owns (?) and manages the place, told me their batchoy recipe is a family secret that has been handed down to them from their great grandmother. Verdict? Their batchoy is rich and flavourful. At P80 per big bowl serving, it's a deal! From high-zoot to to no-zoot, my next stop was Super Batchoy House II (Cuadra St. near Gatuslao St.) near the public market. Batchoy is all they sell...in 6 categories! It was a glorified wet market resto type and they know batchoy! At P55 for their midddle-of-the-road batchoy, it was chock-full-of-ingredients. Extra soup came at no charge with added chicharon toppings. Whoa! 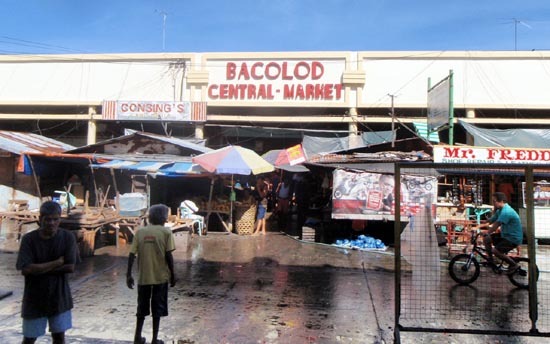 Mel Bascon: Bacolod is black or white. Everything is based on sugar. If sugar harvest is good, then there's plenty for everyone. If sugar is bad, then there's doom and gloom. Unlike in Manila, lechon in the Visayas don't come with sauce. It's not needed as they infuse the lechon with herbs and spices while it roasts on a spit. Ever since I tasted that mouth-watering lechon in Siquijor at Kram's wedding, I've become a lechon fan. Everywhere I go, I seek out the local lechon and see if it can do better than my Siquijor benchmark. Honestly, I don't think any lechon ever will. I've romanticized that lechon in my mind, it's now stuff legends are made of. But that is not to say I'll pass off on a lechon opportunity. Along Araneta Ave., just south of BongBong's Pasalubong Center, is an array of lechon vendors, each offering the lechon crispy skin as a come on. 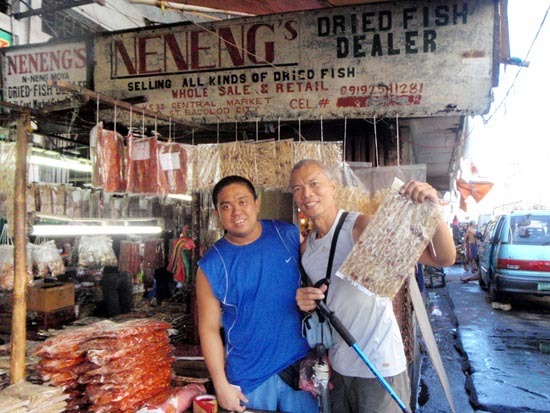 At P350/kilo, me and my climbing crew had cholesterol to literally die for! These places came highly recommended but either I ran out of time or money. Chances are, I ran out of both. I hope you get a chance to try these out and post your comment on this story. 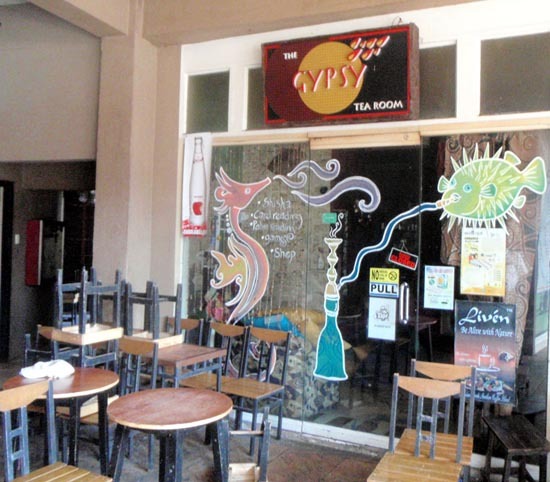 Gypsy Tea Room at Sorrento Bldg, Lacson St.
From the few people I talked to, what I noticed about Bacolodnons is their need to explain themselves - not by way of apology but simply to give an outsider a sense of bearing. Bacolodnons need to have their comfort. That seems to be on top of the agenda. If sugar is good, they want to have the latest model or the latest gadget. I was advised that since sugar is good this year, by October, many bikers will be buying the latest mountain bike models and will dispose of whatever they're riding on...for a steal (so it's a good time to buy a decent used mountain bike). Parallel to that, again, because sugar is good, this October's Masskara will be outlandish! There's definitely more to explore in Bacolod but alas, there's not enough time and money. It will have to wait for the next time. For now, I am already off to discover the Paris of Negros - Silay. (Sep 7, 2010) ...sooo nice to see you after all these years...you look great..... thank you--thank you for adding us to your website.. you are soooo welcome to come back and visit us again.... stay well...Cheers! (Sep 1, 2010) Negros is a fascinating island isn't it? Great that you got to meet my brother! And that you enjoyed 21. 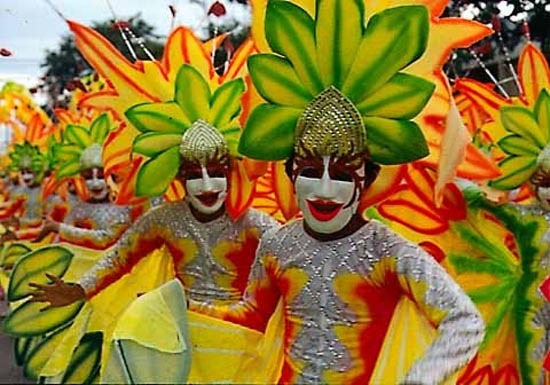 Ever been to the Masskara festival?